New promo has just announced directly from Richcraft for anyone who purchases The Bowery. Buyers have the choice between no condo fees for one year, free storage locker, upgraded designer package, or hardwood in the bedroom. While you might have a preference on which you would prefer, it will depend on the size of the unit to decide which option would be the best option. No condo fees for one year is typically a rebate or discount off purchase price. Easily calculated for the size of the unit - $0.36sqft 800sqft = $3456/year or 400sqft = $1728/year. Storage lockers are priced around $3,000. Then the designer package and hardwood depend on the unit. Questions about the building, units, or purchasing pre-construction condos in Ottawa? I would love to chat - fill out the form below or email directly Matt@MattRichling.com. 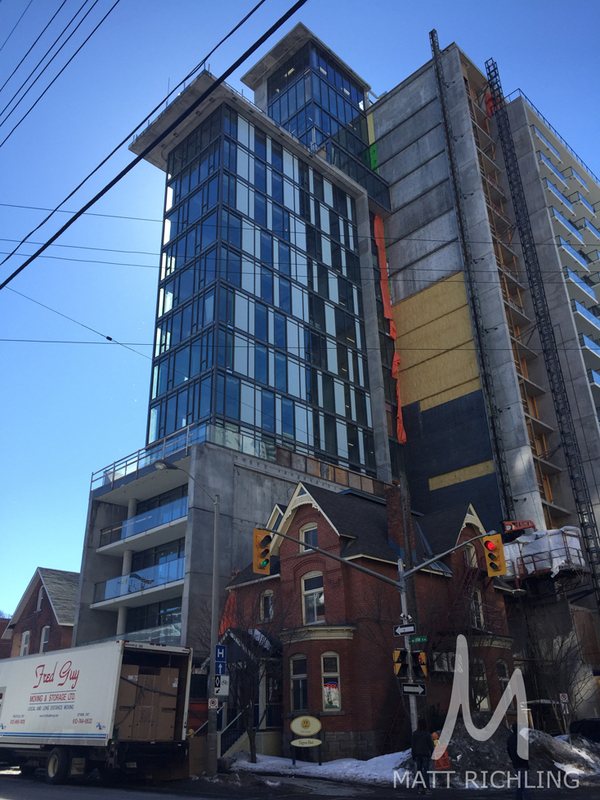 The Slater - a 21 Storey tower that is mixed condos and a boutique hotel, at 199 Slater Street just off of Bank St. Developed by Broccolini the project is currently at around 80% sold out. Units range from 408sqft up to 1929sqft. "Inspired by the clean, square lines of the mid-century towers that surround it, it marries a hip 1950s aesthetic with a thoroughly modern sensibility. Minimalist interiors by II by IV are cool, classic and understated. The Slater is beautiful, sleek – and eternally chic. " Last week I was invited to a limited brokers lunch where Broccolini walked through the project status, what is left for sale, a new promo being offered and a sneak peak for their next downtown space. Overall the project has seen good success, and a few units still remain. The promotions are not being advertised so if you are interested, contact me. If you are interested in The Slater, and learning more about current promotions that are being offered, contact Matt Richling at Matt@MattRichling.com or by filling out the form below. Just announced, Windmill's next condominium building will be launched next weekend. Highly anticipated, this launch is the first for the Chaudiere Falls multi-phase future development with a mix of residential housing types of low and high rise condominium towers and townhomes, commercial and office space, unique waterfront plazas and outdoor squares, recreational facilities, and more. There are only 65 condo units available with pricing starting from $199,000. Starting at 10am until 4pm on the 30th of May at the "state-of-the-art" sales center at 3 Rue Eddy in Gatineau. Windmill has come out and said they will be offering "opening-day incentives". From the Zibi website: The Chaudière Falls have long been a gathering place where the remarkable occurs. Long before settlers arrived, First Nations gathered at the Falls, trading stories of the River, and making offerings at the Falls. In 1799, after several reconnaissance missions, Philemon Wright determined that this location was the best spot in the Ottawa Valley to settle, creating a community at this very location. ‘Big’ Jos Montferrand later made history crossing the Union Bridge, providing inspiration to hundreds of thousands. Years later E.B. (Ezra Butler) Eddy and John Rodulphus Booth both became Canada’s early entrepreneur stars, innovating and inspiring, and employing thousands. To request an appointment or to learn more about the project contact me using the form below, or contact Windmill sales center directly. The Ottawa Citizen looks at the four models that are opening to the public tomorrow March 14th, inside the Gotham Condos. Of the 240 units in the building, only 40 suites remain, with pricing starting at $262,900 up to $451,900. Built by Lamb Development, the building is starting occupancy March 24th, 2015. Questions about Gotham? I would love to help. Condo buyers anxious for a taste of life at Lamb Development’s much-anticipated Gotham — a name that evokes robust images of both New York City and Batman — can do so Saturday when four model suites open to the public. The models, ranging from 497 to 922 square feet, feature strong industrial accents such as exposed concrete as well as generous glazing and contemporary decor. The 17-storey building of glass, steel and black brick towers over a mostly low-rise neighbourhood at the corner of Gloucester and Lyon streets. The project has sold well since it launched four years ago: only 40 of its 240 units remain available, and the builder may keep some of those unsold condos as rentals. Penthouses and “glasshouses” (spectacular, glass-enclosed units) have all sold. Construction was slowed by this winter’s extreme cold, but company president Brad Lamb says buyers are expected to take occupancy by March 24. The remaining units will be sold four at a time, and there will always be a quartet of model suites for viewing. Lamb calls the approach a “patient” way of selling. Keeping your customers a little hungry is also a smart way of selling. Available suites at the time of writing range from $262,900 to $451,900. The model suites embody the company’s fondness for contemporary, industrial-tinged design, according to Lamb. Lamb says the models target Ottawa’s main condo market: young singles, young couples, the occasional 50-plus pair without children. The project will include seven condo townhomes with private patios and 20-foot-plus ceilings in the living/dining rooms. Five of the seven homes have sold. Loft 08/09: The one-bedroom, 497-square-foot unit may be the smallest of the four models but, like all the condos at Gotham, the shotgun-style layout captures some of the great outdoors thanks to the wall of glass in the living/dining/kitchen area. The expanse of glazing includes a patio door leading to the standard-issue balcony with its gas barbecue hookup. The kitchen features stainless-steel appliances including a gas stove, and the sleek, white Euro-style cabinetry matches the quartz countertop. The finishes in the models are all standard features, says Lamb. The bath and bedroom, the latter with three walls only and simply decorated to reduce clutter, sit between the entry and the main living area. An exposed concrete wall runs the length of the model, which is priced at $262,900. Loft 10: With both a den and a bedroom, this unit maxes out its modest 648 square feet. The den, just off the entry, sets the contemporary tone with its exposed concrete wall, black-and-white photo of a manual typewriter, and a metal-and-glass floor lamp. A round wooden table set with white candles and surrounded by wood and-blue fabric chairs lends warmth to the living area with its one concrete wall and ceiling that are Lamb standards. The bedroom’s sliding, frosted-glass door would provide privacy if you had a guest sleeping on a pull-out couch in the adjacent living room. Loft 11/12: Another bedroom-plus-den unit, but at 751 square feet, this one has extras such as a four-piece bath with access from both the bedroom and den. The kitchen, which is just off the foyer, has an elegant feel thanks to the blend of charcoal grey cabinetry and white countertops. The suite, which sells for $357,900, features dark wood flooring and striking furniture, like a metal and timber credenza. Loft 07: At 922 square feet, this unit has room for a den, a bedroom large enough for a compact tub chair in one corner, a four-piece ensuite with an undermount sink, and, just off the foyer, a powder room. Contemporary reigns in the living area with metal basket dining chairs, a gleaming white laminate credenza, and low-slung steel and fabric easy chairs. The kitchen sports a large island with a double, undermount sink and contemporary fixtures. The backsplash is light grey subway tile. It’s a short walk to everything from Bank Street’s restaurants and stores to parks like the one overlooking the National Library of Canada. For those with a green thumb, there are a couple of nearby community gardens, including one at Nanny Goat Hill at Laurier and Bronson. What: 240 condo units in a 17-storey downtown tower. Also an adjacent seven-unit townhome condo development. Prices: Apartments that will be available as of Saturday start at $262,900. Condo fees: 42 cents a square foot. Parking, $35,900. Sales centre: 224 Lyon St.